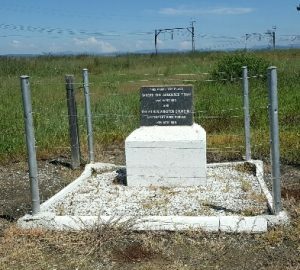 Famous connections: memorial on the site of the train ambush where Winston Churchill was captured. A few weeks later Mohandas Gandhi passed the same spot. Post 1990 memorial on Spion Kop to the Indian Stretcher bearer Corps. Was Ghandi the last British commander on the hill? Constitution Hill – the old gaol buildings preserved next to the Supreme Court building – which is made from bricks from the prison. Entrance to the Apartheid museum. Visitors are assigned entrance tickets randomly marked as white or non white – and follow a different route. 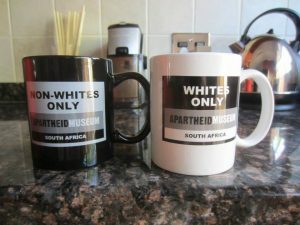 Each of the rear views of modern South Africans is linked to a display in the museum telling the story of the country through the eyes of an ancestor. This personal stories approach is similar to that used by the Liberation Route Europe. The Republic of South Africa is a country which has systematically promoted its battlefield and other conflict sites as heritage tourism destinations. It is also a country that has been shaped by the conflicts between the different peoples of different races. The wars against the Xhosa in the Cape, the wars between the Boers and different native tribes, the Anglo Zulu and Anglo Boer wars left their legacy in the Union of South Africa, the apartheid regime which replaced it, and the modern South African state. 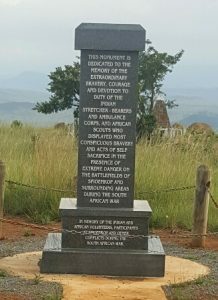 It is hard to understand South Africa without knowing something of the significance of the battles of Blood River, Ulundi and Spion Kop. I have used the term “conflict” rather than “battlefield”, as the scope of the heritage is far wider than purely conventional battlefields, including the prisons and memorials that tell of the conditions of the majority population under colonial and apartheid rule. It is also a story with a wider international significance. British reverses at the hands of the Zulus and Boers were visible signs of the fragility of the British Empire. The Anglo Zulu War generated the iconic images of colonial warfare – the film Zulu. The Anglo Boer War brought together men who would influence the world long after the peace of 1902: Kitchener, Haig, Churchill, Gandhi and Smuts. Many of the sites are very well preserved by European standards. The battlefields are often dominated by substantial topographical features, rivers and Kojpies. Over the last century human settlements have grown larger. The centre of the colonial town of Ladysmith is filled with shopping malls, and a power station obscures the view from Long’s guns at Colenso. However, many of the actions took place outside settlements, and it is still possible to trace the pattern of some of the shallow trenches and rock sangers. War graves also provide archaeological evidence of the battlefields. Road maps and tourist guides to the country include the battlefields and memorials. 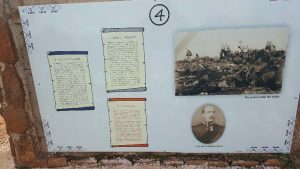 Historic sites are signposted, and many include informative interpretation for the visitor. There is a network of guides and a scheme to licence guides. This varies by region, with KwaZulu- Natal promoting their battlefield heritage of the Anglo-Zulu and Anglo Boer wars as a destination. It is easy for an informed visitor to find the sites and interpret the ground. There is a lot to see, and a lot of food for thought. There are layers of interpretation, which reveal the interests and priorities of different regimes. 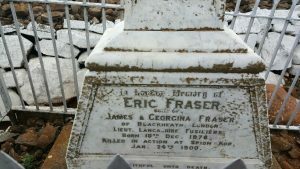 For example, at battlefields such as Spion Kop and Caesar’s Camp there are the graves of British and Boer soldiers who fell, and British Regimental memorials. 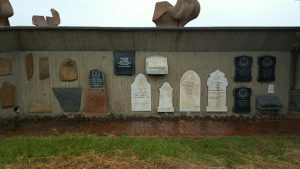 There are then more elaborate memorials to the Boers, with concrete paths presumably erected in the Aparthied era and more recent memorials, that remember the African and Asians who also took part and suffered. 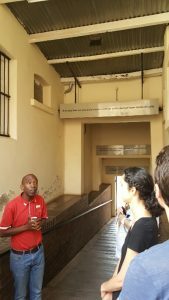 The preserved prison buildings on Constitution Hill, Johannesburg are a stark reminder of the experience of those who fell foul of racist regimes, where the discriminatory pass laws blurred the difference between political and criminal offences. The visitor bears witness to the inhumanity of mankind. 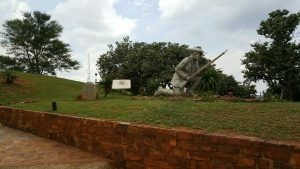 About fifteen miles away on one of the hills overlooking Pretoria is the Voortrekker memorial, built in 1948. 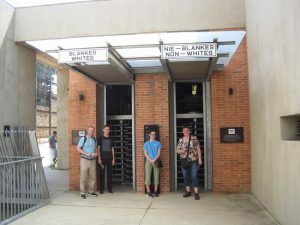 It is a memorial and museum which tells the story of the Afrikaans struggles against the African tribes and the British, using the language of a white supremacist regime. It is hard to imagine, say, memorials in Germany Europe advocating Italian Fascism or the world view of German National Socialism. 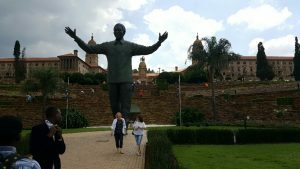 Symbolism in front of the Union Buildings Pretoria. In the foreground: a statue of Mandela with arms raised. In the background, below Mandela’s elbow, is a copy of the South African War memorial at Delville Wood; a symbol of an earlier age. It is surmounted with a bronze of Castor and Pollux, by Alfred Turner. They represent the two white races of the South African Union, British and Afrikaans. 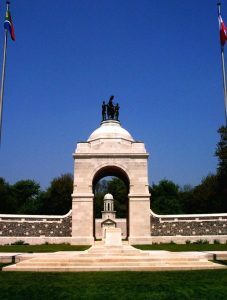 The summit of the park is the Garden of Remembrance, a focus for national commemoration. 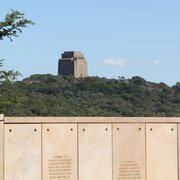 This has a roll of honour of those who contributed to the freedom of the country in the main conflicts in South Africa’s past, among them genocide, slavery, the wars of resistance, the Anglo-Boer wars, the First and Second World Wars, and the struggle for liberation from apartheid. Of course, the current state faces little threat from any resurgence of white supremacy. 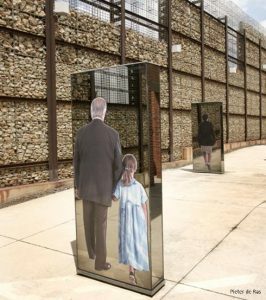 But the decision to leave layers of historic interpretation is also due to the tone set by Nelson Mandela. The truth and reconciliation commission under Archbishop Desmond Tutu, with a remit which extended to reparation and reconciliation, made any rewriting of history seem rather petty. Souvenirs mugs based on the arbitrary entrance tickets: controversial conversation piece or a joke in poor taste? Firstly, the experience of South African conflict heritage deserves wider notice and study. The Republic of South Africa has taken conflict heritage tourism seriously and invested in destinations, marketing, preservation and interpretation and supporting a network of licenced guides. It started this strategy over a decade ago. There is evidence emerging about the value and and implementation issues. Knowing the answer to this would help anyone interested in battlefield preservation. 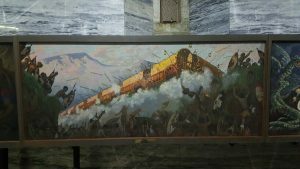 The second question is what lessons can be learned from how South Africa presents its history for telling the story of European wars, in particular those of the C20th? There are parallels between the problems of presenting the conflicted history of South Africa and that of Europe. Different peoples have different myths and memories from a traumatic past. There is something positive in the idea of drawing on a shared experience as a catalyst for reconciliation, creating mutual understanding and a united future in peace and freedom. While South Africa is very different from Europe, it is a useful benchmark for organisations such as Liberation Route Europe. 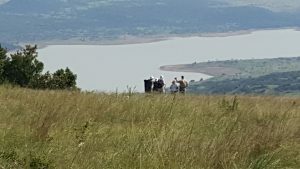 Maricki Moeller: Battlefield Tourism in South Africa with Special Reference to Isandlwana and Rorke’s Drift KwaZulu-Natal.